This species is accepted, and its native range is Mexico (S. Zacatecas, S. Durango). 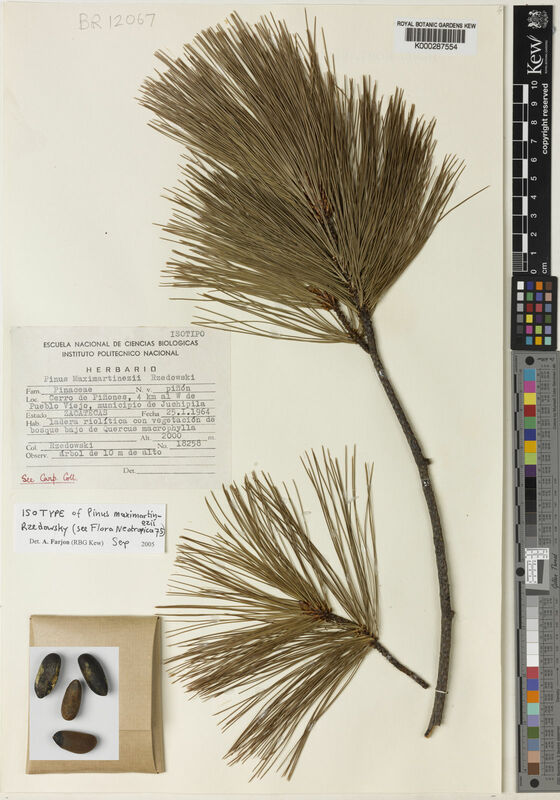 Pinus maximartinezii is rated as Endangered (EN) according to IUCN Red List criteria and has received a EDGE score of 0.91, which places it in position 282 on the EDGE Gymnosperm list. It has a Evolutionary Distinctiveness of 49.5, ranked 554. More information on the EDGE Gymnosperm project here https://www.edgeofexistence.org. González-Elizondo, M., González-Elizondo, M.S., Ruacho-González, L. & Molina-Olivera, M. (2011). Pinus maximartinezii Rzed. (Pinaceae), primer registro para Durango, segunda localidad para la especie Acta Botanica Mexicana 96: 33-48. Instituto de Ecología A.C.